Yet again Cheteshwar Pujara proved his valour by hitting the 18th Test century and third of the ongoing four-match series in the fourth and final Test against Australia at the Sydney Cricket Ground on Thursday. India vs Australia 4th Test Sydney: Yet again Cheteshwar Pujara proved his valour by hitting 18th Test century and third in the ongoing series on day 1 of the fourth and final Test against Australia at the Sydney Cricket Ground. After losing KL Rahul in the second over of the opening day, Pujara once again had to start his rescue act against the new swinging ball of in-form Pat Cummins and Josh Hazlewood. India’s No. 3 again showed great calm and composure as he stitched a crucial partnership of 116 runs with Mayank Agarwal to soak up the pressure. It eventually helped India to dominate the second session of the opening day of fourth Test. Zindagi na milegi Dubara, Khelte dekh lo Pujara.. 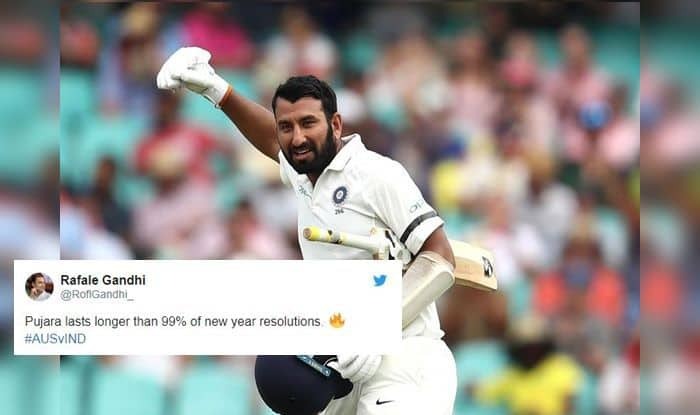 Moreover, Pujara also became the fifth Indian Test batsman, after Dravid(1203 balls – 2003/04), Vijay Hazare (1,192 balls – 1947-48), Kohli (1,093 balls – 2014-15) and Sunil Gavaskar (1,032 balls – 1977-78), to have faced 1,000 or more balls in a Test series in Australia.